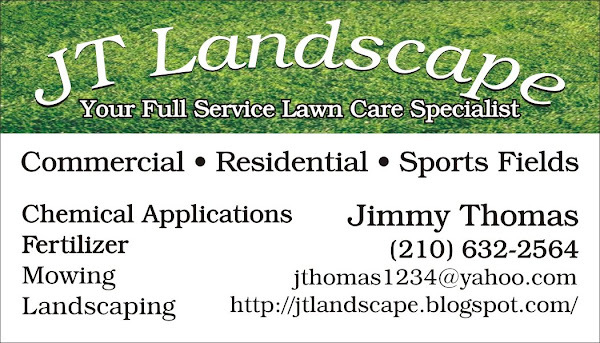 The purpose of JT Landscape blog is to provide lawn and landscape observations in and around San Antonio that may be helpful in maintaining a beautiful landscape. The posts below may be insect or disease problems that have been recently noted in the area or advice pertinent to lawn care practices needed in a particular season. In spite of the cold weather, Spider Mites have been seen recently on Photinia, Italian Cypress and other plants. Many Mt. Laurels have been attacked by a caterpillar type worm. This worm is the larval stage of a moth. The caterpillars also leave a webbing in the area where they feed. The worms can be ignored or knocked off the plant with a stream of water if the infestation is not too severe. Infestations that are creating significant defoliation should be treated with an insecticide. Additional information on this pest, including some specific control products can be found at the link below. The summer heat is taking a toll on our lawns. However, I have actually been surprised to see how well some St Augustine or Zoysiagrass yards have done in the shade with only one day per week watering. Those that have survived well are watering 2-3 cycles on the water day and of course they are benefiting from the protection that the shade provides. Sunny locations are stressing out greatly from the limited water. Brown Bermudagrass or brown Zoysiagrass can still recover in most cases with water, while St Augustine that looks brown is not likely to recover. Those that have dead St Augustine in full sun should consider replacing it in the future ( after the drought) with Zoysiagrass or Bermudagrass or perhaps plant beds with drought resistant plants. David Rodriguez of the Agricultural Extension Agency suggested on the 6pm news several good ideas : 1. Apply up to 2 inches of water on your water day in the widow of time allowed by stage 2 water restrictions ( 3am-8am and 8pm -10pm) 2. Hand water dry grass and plants as even native plants are stressing with the prolonged drought 3. Addition of mulch to beds to conserve water 4. Think about fall and spring redesigns to replace some turfgrass areas with low water use plants. Check back for future posts with information on a SAWS rebate for those that make water saving changes in the landscape. As you certainly have heard by now, SAWS has declared stage one water restrictions and we can only legally water once per week. This time of year that is not all that stressful on our grasses. If we are still watering once per week after summer is here with daily highs of 95 degrees, that will be a concern for certain grasses in certain situations, such as St Augustine grass in the full sun. Bermuda grass and Zoysia grass are less affected in the long term by the drought. This is because both of these grasses have under ground stems called rhizomes. In a bad drought the leaves and above ground stems may all die, but as soon as a good rain comes, the underground stems or rhizomes will send up new growth. St Augustine has no rhizomes and when it looks dead it probably is dead. What can I do to survive the restrictions? Your water day starts at mid-night, so set you clock to do a mid-night cycle and the set it for a early morning cycle, such as 6 am. Using two start times is a good way to allow applied water to soak in. For example, two 10 minutes cycles separated by a few hours will do more good than one 20 minute cycle that starts to run off after 10 minutes due to the slow rate at which our heavy clay soils accept water. This idea is easy to use with small systems because you do not need to worry about how long it takes to finish the cycle. The last cycle on your water day must finish by 10 am. However, even if you have a large system that needs from mid-night to 10 am to finish, you can benefit from this idea. Just divide you run times by 2 and set the clock to do 2 half cycles in stead of one long cycle. Create strong roots by proper mowing height and mowing frequency and never remove more than one-third of the plant in one mowing. For example, if the grass is 3 inches tall, do not cut below 2 inches. This will mean weekly mowing when the grass is growing or mowing at taller mowing height. Proper fertilizer applications for strong roots. Hand watering is legal in stage one at any time on any day. After your water day passes you will see certain areas wilt stress quicker than others. Give those areas some water with the hose. This is a great way to save water as you put the water only on the part of the yard that needs it, not the whole yard. 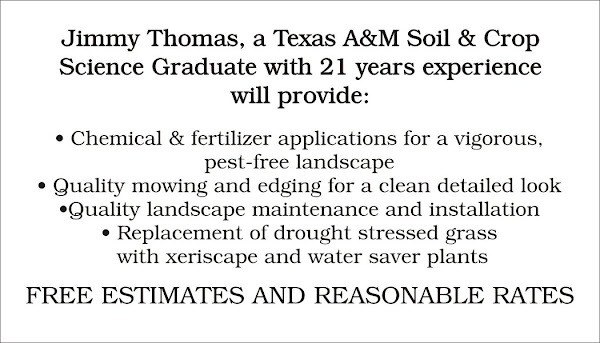 Mid February to early March is the right time to apply pre-emergent weed control products in San Antonio. These products will not kill the weeds that are already present. They will prevent the germination of new weeds seeds. Thus it is very important that the product be put out before spring weed germination. At the local garden centers and the home improvement stores you will find many weed and fertilizer combinations. The nitrogen in the fertilizer is really not needed yet and is wasted this time of year. However, for the "do it your selfer" the weed/fertilizer product is a method to apply the pre-emergent weed control. As always, carefully read and follow the directions to prevent damage to the grass or plants. JT Landscape can apply the pre-emergent in a liquid formula without any fertilizer and will be happy to quote your property. 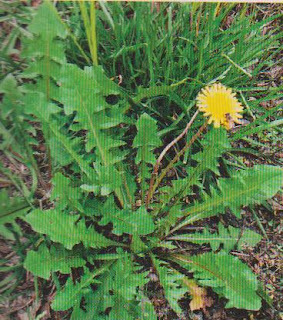 Weeds are broken down into two large groups called broadleaf weeds and grassy weeds. It is important to know what group your weed falls into because that will determine the type product needed for control. Basically, if the leaf has parallel veins and looks like a grass it probably is a grassy weed. If it does not have parallel veins it is probably a broaleaf weed. This the time of year when the winter broadleaf weeds can start to thrive. They can be controlled with a good broadleaf weed control product available at most retail garden centers. It is extremely important to use the right product and apply it exactly according to the labeled instructions. JT Landscape uses a mixture of different broadleaf weed killers and can get a very good level of control with only one application. Cool season grassy weeds are harder to control but JT Landscape has products that will remove these type weeds without harming your lawn grass. This discussion has only addressed post emergent weed control. A future post will discuss pre-emergent weed control or weed prevention. Compost application on the lawn will help provide nutrients for your yard. Some experts believe it is a great way to conserve water and it may reduce some disease problems in St Augustine grass. It clearly does help make for a healthy turfgrass. The key is to use a well composted product from a supplier like Fertile Garden Supply. We spread it with shovels and wheel barrows and then use the back side of a steel soil rake to work it into the grass. If you have shallow soil it is a good idea to use a mixture of compost and soil instead of straight compost. Companies like Fertile Garden can help you chose a product that provides soil and compost. The Fertile Garden "light garden mix" is one example of a soil and compost product that would be good to build up the depth of your soil by repeated applications over several years. I continue to see more spider mites on shrubs this week. Above is a photo of spider mite damage on the Boxwood shrub. Notice that in this close up the mites are far to small to see without a 10 x lens. The leaves get more of a yellowish speckled look on the Boxwood. 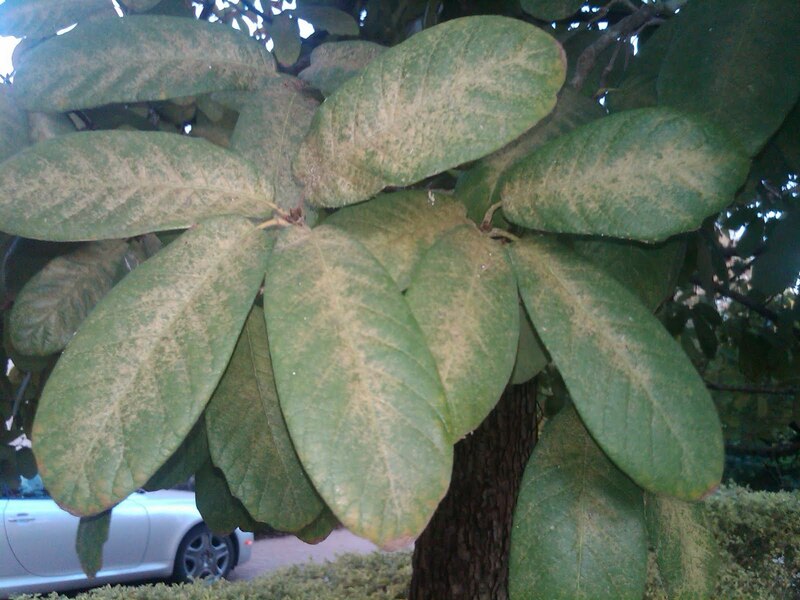 While the Photinia leaf seems to take on a bronze colored look when attacked by spider mites. See the Jan 31st post for more spider mite information. Spider Mites frequently attack Photinia, Boxwood, and Italian Cypress. They can be very hard to see on the leaf. Many times you can shake them off a leaf and onto a white sheet of paper. This makes them easier to see. If you want to verify that is is not just dust, squash a few specks on the paper and try to smear them across the page. A red streak across the page pretty much confirms the spider mites. The leaf above shows the symptomatic, yellow or bronze speckled look on the leaves . Some experts claim a level of control with a hard spray of water to knock the spider mites off the leaves. Oils or a combination of oils and professionally applied insecticides are the most effective measures. DO I NEED TO WATER NOW ? Normally established ornamental plants and Bermudagrass need little or no irrigation in the winter. However, as Central Texas is in a drought things are a little different this year. A good rule of thumb is to water once per month this time of year. You can allow things to dry out a little more with Bermudagrass or Zoysia grass than with St Augustine grass. If you are still watering once per week or more that is probably more water than is needed this time of year. If you over water you will encourage disease especially in the St Augustine and Zoysia grass lawns.